Beautifully printed certificate from the Kief Tramway issued in 1890. 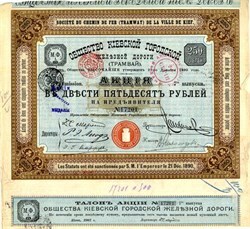 This historic document has an ornate border around it with an underprint of a tram. This item is handsigned and is over 117 years old. Written in Russian and French.